Draft: 2013, Los Angeles Dodgers, 3rd rd. Resides in Tucson, AZ during the offseason...Participated in the Tigers Winter Caravan and TigerFest...Played college baseball at the University of Arizona, where he was named Pac-12 All-Academic honorable mention in 2012, when he led the league with a .369 batting average. Saw the first Major League action of his career in 2018, playing in 74 games with the Reds...also appeared in 49 games with Triple A Louisville...Played 20 games with Louisville in May, hitting .361/.405/.611 with eight runs scored, seven doubles, one triple, three home runs and eight RBI...Made his Major League debut on May 22 vs. Pittsburgh, pinch hitting in the sixth inning...Recorded the first hit of his big league career on May 24 vs. Pittsburgh, hitting a single off Ivan Nova in the fourth inning...added two more hits in the game, including his first career double...Belted his first Major League home run on June 16 at Pittsburgh, a solo shot off Michael Feliz...Hit for the cycle on July 18 at Rochester, becoming the sixth player in Louisville history to hit for the cycle...Made his first career pitching appearance on August 13 vs. Cleveland, retiring all three batters he faced, including a strikeout of José Ramírez...Started four straight games at 2B, 3B, RF and 1B from September 8-11...became the first Reds player to start four consecutive team games at four different positions since Jerry Hairston Jr. played 2B, SS, CF and RF from September 18-21, 2008. Spent the season at Louisville in his first season at Class AAA...led the Bats in runs scored (58), doubles (31), HR (16), RBI (64), extra-base hits (50) and total bases (201)...ranked fourth in the International League in extra-base hits (50) and T5th in doubles (31)...among all Reds minor leaguers ranked T4th in HR and fifth in RBI...became the first Bats player with at least 15 HR and 15 stolen bases in a season since Todd Frazier in 2011...in the 13-6 vs Rochester on 8/20 had 3 HR and 7 RBI...was the first Bats batter with 3 homers in a game since Austin Kearns on 7/5/05 at Indianapolis...fell 1 RBI shy of Mark Dougherty's single-game franchise record (6/21/87 vs Denver)...joined Sebastian Elizalde as the only players to spend the entire season on the Bats' roster...reached base safely in 96 of his 124 apps and hit safely in 81 games...from 7/25-7/28 homered 4 times over 5 apps, including once in each game of the 7/25 DH at Syracuse...on 12/20 was invited to 2018 Major League spring training camp. Spent the season at Class AA Pensacola, where he led the Blue Wahoos with 16 HR, 65 RBI and 182 total bases...was a mid-season Southern League All-Star and SL Batter of the Week for 5/30-6/5...among all Reds farmhands ranked second in HR and fourth in RBI...among Southern League leaders ranked T4th in HR and third in slugging percentage (.434)...averaged a home run every 26.19 plate apps, third-best ratio in the league...following the season played for Peoria in the prestigious Arizona Fall League (16g, .333, 7 2b, 2hr, 11rbi, 1sb, 9r)...made 8 apps at 3B, 6 apps at 1B and 1 appearance in the OF...played in the Fall Stars Game...on 12/9 was invited to 2017 Major League spring training camp, his first. April 18, 2019 Detroit Tigers recalled 2B Brandon Dixon from Toledo Mud Hens. 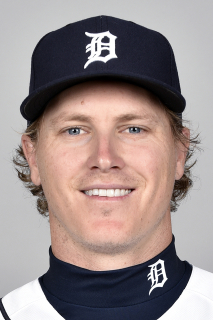 March 21, 2019 Detroit Tigers optioned 2B Brandon Dixon to Toledo Mud Hens. November 2, 2018 Detroit Tigers claimed Brandon Dixon off waivers from Cincinnati Reds. July 21, 2018 Cincinnati Reds recalled 2B Brandon Dixon from Louisville Bats. July 4, 2018 Cincinnati Reds optioned LF Brandon Dixon to Louisville Bats. May 22, 2018 Cincinnati Reds selected the contract of Brandon Dixon from Louisville Bats. January 22, 2018 Cincinnati Reds invited non-roster 2B Brandon Dixon to spring training. April 3, 2017 LF Brandon Dixon assigned to Louisville Bats from Pensacola Blue Wahoos. December 9, 2016 Cincinnati Reds invited non-roster 2B Brandon Dixon to spring training. March 6, 2016 2B Brandon Dixon assigned to Cincinnati Reds. December 16, 2015 2B Brandon Dixon assigned to Pensacola Blue Wahoos. September 1, 2015 2B Brandon Dixon assigned to Glendale Desert Dogs. August 14, 2015 2B Brandon Dixon assigned to Tulsa Drillers from Rancho Cucamonga Quakes. June 20, 2015 2B Brandon Dixon assigned to Rancho Cucamonga Quakes from Tulsa Drillers. April 8, 2015 2B Brandon Dixon assigned to Tulsa Drillers from Rancho Cucamonga Quakes. March 6, 2015 2B Brandon Dixon assigned to Los Angeles Dodgers. August 15, 2014 Rancho Cucamonga Quakes activated 2B Brandon Dixon from the 7-day disabled list. August 13, 2014 Rancho Cucamonga Quakes sent 2B Brandon Dixon on a rehab assignment to AZL Dodgers. July 8, 2014 Rancho Cucamonga Quakes placed 2B Brandon Dixon on the 7-day disabled list. March 31, 2014 3B Brandon Dixon assigned to Rancho Cucamonga Quakes from Great Lakes Loons. June 20, 2013 3B Brandon Dixon assigned to Great Lakes Loons. June 19, 2013 Los Angeles Dodgers signed 3B Brandon Dixon.